Reinforcements are on the way! Justice shall be ours! Booster #2 fleshes out the fleets of the Empire of Steel! 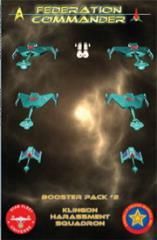 With 7 laminated ship cards, ranging from the ubiquittous F5 Frigate to the mighty D7C Command Cruiser, Booster Pack #2 is just what you need for crossing the Federation border! The counters for these ships were included on the countersheet for Federation Commander: Klingon Border. For miniatures support for Boosters #1–3, see Border Box #1.